We enjoyed a super-fast installation period that even occurred during school time. This caused minimal disruption to the school day, with the installation team passionately working endless hours to get the product finished before Easter bank holiday. The Century Play facilities have been designed by Angus Firth Design with all of the family in mind to ensure maximum fun and excitement. 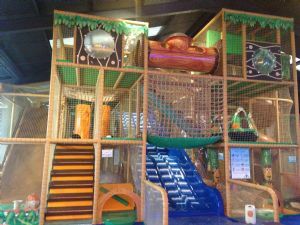 With a Junior area, Toddler area, Baby area and Sports areas, all under the one roof. The play centre is complimented by 6 themed party rooms. See our Facebook page for further details.